Regular/annual: Whooper Swan, Teal, other duck, Water Rail, Redpoll. Scarcer species & rarities: Green Sandpiper, Chough (5 km from sea). Access: Ballinlough is just west of Kill village, which is signposted at the Sweep cross (see under Knockaderry) and at Carroll’s Cross (see Ballyshunnock), both on the main Waterford-Cork road. A rough track up the east side of the lake, and continuing north along the inflow stream, provides easy access. 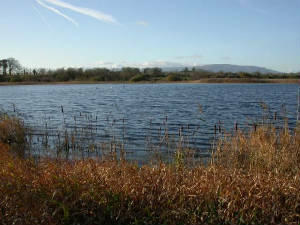 Although a much smaller lake than nearby Knockaderry and Ballyshunnock, Ballinlough will usually provide good views of several waterfowl species in winter. 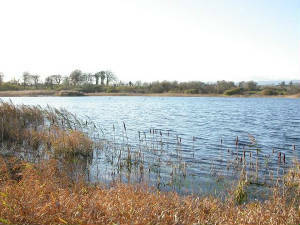 The lake is shallow and biologically productive, providing good feeding for swans, Teal and Mallard. Mute Swans breed annually, while Whooper Swans occur in most winters. Early morning may be the best time for duck, as they often spend the rest of the day at the larger lakes, where they are less subject to disturbance. Moorhen are present all year round, Water Rail winter and probably breed in the reeds which fringe most of the lake. The lake rarely dries out enough to attract migrating waders in autumn, but Redshank and Green Sandpiper have occurred, and Snipe breed along the inflow stream north of the lake. Good numbers of Sedge Warblers also breed along the stream and around the lake, along with Grasshopper Warbler, Whitethroat, Redpoll and other passerines.